Sunrise at the end of Higgins Way. This charming, modern, waterfront, air-conditioned cottage is located in the exclusive section of Orleans called Mayflower Point where the Namequoit River meets Little Pleasant Bay. 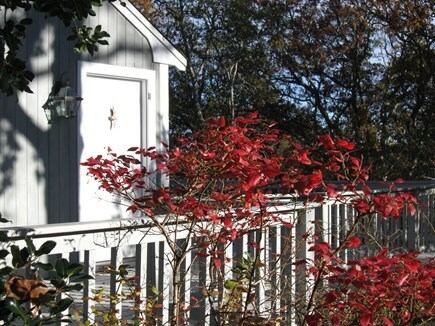 The secluded cottage boasts scenic water views, quiet nights, and birds galore. The living space has A/C, ceiling fans in the main room and bedroom along with hardwood floors throughout, new appliances, and windows on all sides. 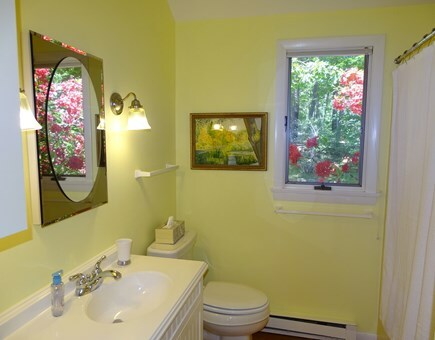 The grounds around the cottage are full of mature trees, flowering bushes and plants -- beautifully landscaped. Settle into this wonderful vacation spot with plenty of closet space and a fully equipped kitchen. The one level cottage has a wraparound deck off the living room accessible thru sliding glass doors and a second deck thru the bedroom slider to enjoy that cup of morning coffee. It sleeps only two, so you both can truly get away on your own – a break from the pace. 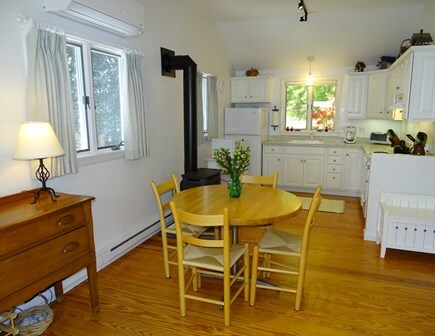 The cottage has high speed internet service, an HD flat screen TV with cable, and a DVD player. 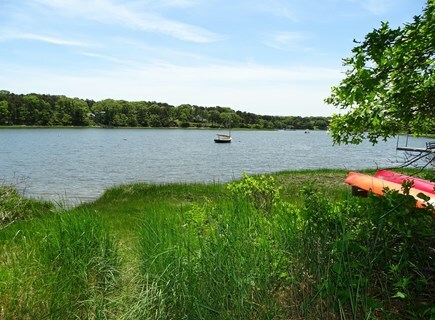 It is a 75 yard walk to the water where you can launch your kayak or paddleboard. Skaket Beach on Cape Cod Bay is 3 miles away, and Nauset Beach on the Atlantic Ocean is 4 miles away. There is a ramp from the driveway to the one step onto the front deck. All the living is one level. It is always wonderful to have you return to the cottage for your two week sojourn in this beautiful spot. I think you both might love it here more than we do -- hard to imagine. You did paddle everywhere this year and did explore on your bikes more and more of the Cape. We hope we see you next year for your sixth time in the cottage. Thanks again for renting with us. All the best. We are finishing up a 2 week stay at this guest cottage. The house and location have exceeded our expectations in every way! The location in the private Mayflower Point area is incredibly quiet and picturesque. The private dirt roads are a pleasure to walk. Residents have made a concerted effort to preserve the natural landscape. Much to our surprise, we have seen turkey and deer on the property. And we have heard the Great Horned Owl at night. While kayaking we have seen an Osprey, seals and a pair of swans. The cottage is immaculate. The owner has done everything imaginable to assure that renters will be comfortable. The decor is charming. Ceilings are high and there are lots of windows and sliders - all contributing to the bright, airy ambiance of the cottage. We are already chatting about our next visit! Thank you! We are so happy that you have had a good two weeks here. The weather was wonderful (OK there were two unbearably hot days but the AC helped) and it seemed like you two explored ALL of Pleasant Bay in your kayaks. This is a wonderful spot to experience the calm of the waters and nature all around. Hope we do see you again next year. Thanks for renting with us. 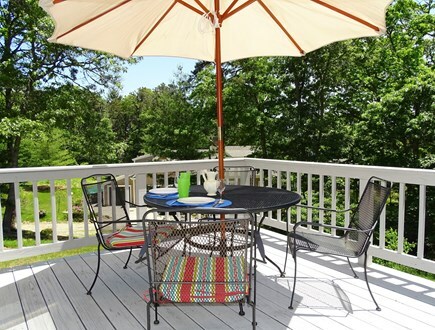 Exceptionally quiet, clean and comfortable cottage with 2 deck areas and outdoor gas grill. Layout is great; lots of window light. A perfect fit for two. Owner is pleasant and responsive. Orleans is full of natural beauty and is convenient for Cape excursions. So glad you had a great time in the cottage, despite the rain storm one afternoon. . We enjoyed having you both and are glad you appreciated the quiet of the neighborhood. Here you are in the middle of August and "August" is barely noticeable on Mayflower Point -- little traffic and NO noise -- that's what we love about it here. Hope you will be back next year and again, thank you for renting with us. This was our 5th year at this wonderful cottage. It has everything you need for a delightful week from home. This year we hiked, beached and shopped (not my husband's favorite thing to do!) and coming back to the cottage to relax on the wraparound deck was the perfect way to end each day! If you are able to visit in June, I highly recommend it. It's a perfect time to visit ..the days are warm, the beaches aren't packed, and you rarely, if ever, wait at a restaurant to be seated. It's our favorite time of year at the Cape. It was great to have you back again this summer. 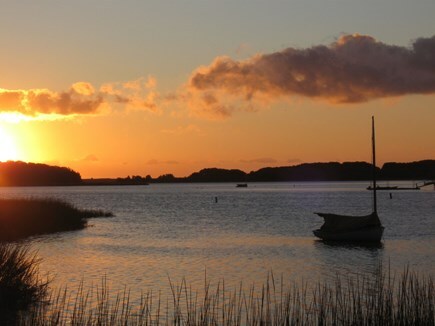 We agree that June is probably the best time on the Cape for all the reasons you listed. This year you had a perfect weather week with everything in full bloom on those longest sunny days. See you next summer and again, thank you for renting with us. My husband and I stayed at this wonderful cottage for a week at Mayflower Point during the past six summers (2012-2017). After our first stay, we knew that we would return every year because we immediately felt at home there. If we hadn't decided to build our own house and make the Cape our permanent home this year when we retire, we'd be returning to the Mayflower Point. 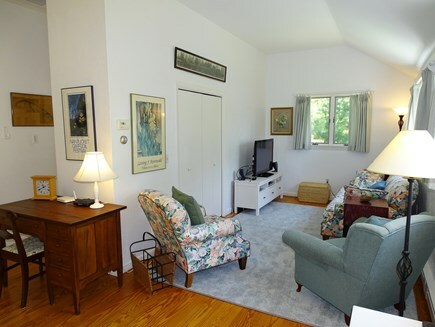 The cottage has everything you need and its location is perfect - secluded, yet an easy drive to Orleans, Chatham, beaches, ponds, hiking trails, restaurants, etc. There is direct access to launch your kayak or canoe and you don't need to drive anywhere to take a beautiful walk. If you rent this cottage, you will love that the only thing you need to bring are your sheets and towels. The washer and dryer are a plus, as is the fully equipped kitchen. 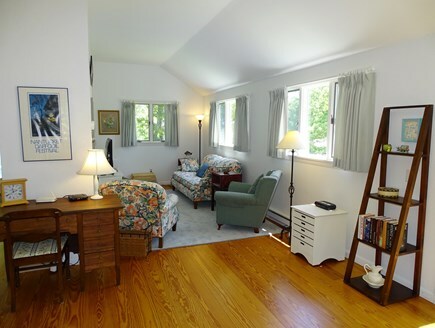 The cottage has been upgraded over the years since we first stayed and it now has air conditioning - a big help if you're there during the hottest time of the summer. The internet connection is excellent and there's cable TV. You will also find beach chairs, games and puzzles, books, tourist brochures, and videos. 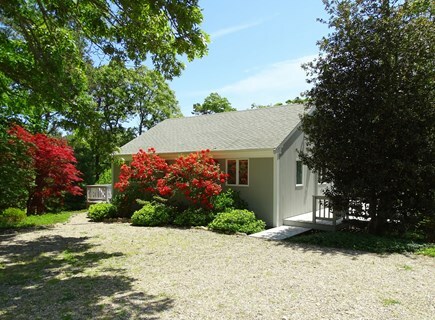 We loved having you all those years and are so happy that you found and built your dream place to finally retire here on the Cape. We will miss having you as cottage guests but look forward to having you as part of the Cape community. Thank you for your review -- it is great to know that your first time in the guest cottage was so enjoyable. And we like that we are "off the beaten path," so to speak. Makes for a quiet, peaceful vacation for everyone. We enjoyed having you and look forward to having you come again sometime in the future. What a wonderful beginning to summer. We truly love your little cottage and how, when we come down the driveway, it feels like coming home. We had another wonderful week of peace and relaxation. Thanks for the wine. We had it when we grilled fish - it was delish! We enjoyed having you stay in the cottage for your fourth year in a row. That week in June is always reserved for you both and so glad you had an even better time this year. See you next year. My husband and I stayed here for a week and loved it. It's peaceful and very private, yet ideally located for access to all the Orleans waterways and related boating and beach activities. 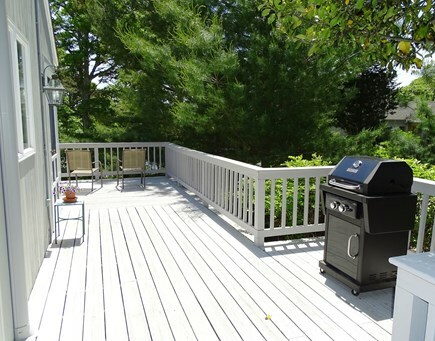 Close to Captain's Golf Course, an easy drive to Chatham, Orleans, Brewster, Harwich. All that said I was content to just sit on the decks and drink coffee (or wine). It was hard to leave each day but we sure did and we had a great time. Very clean and comfortable and well outfitted. Thanks again, Molly. This is our third year staying at this perfect Cape Cod cottage and we will be returning next year. The cottage has everything you need for a wonderful visit including birds singing and a delightful breeze off the water. If you are looking for a peaceful charming place this is it. Thank you Molly for sharing this wonderful place -- we love it! 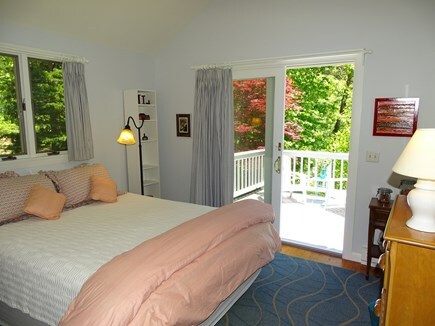 We have rented our guest cottage for the past 12 years, thru local Cape realtors and until last year thru VRBO. We have many repeat renters who keep coming back -- the best references a property owner could have. This is our first year with Weneedavacation. We stopped our listing on VRBO because of their new business practice of limited communication between owners and renters and their hidden fees. We believe that you should be able to communicate with a property owner to ensure the space is what you think it is and one you will enjoy on your vacation. 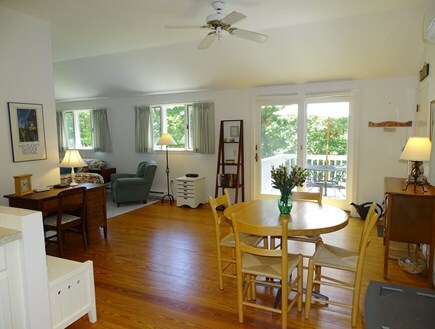 We believe that if you love the outer Cape and all that is has to offer, you will enjoy Orleans, Mayflower Point, and our cottage. Our past reviews support our beliefs and we hope you will explore our listing. All of our past renters would agree -- the greatest asset of our cottage is the peace and quiet where the sounds are mostly just birds. It is peaceful and beautiful with woods, water, and wildlife. 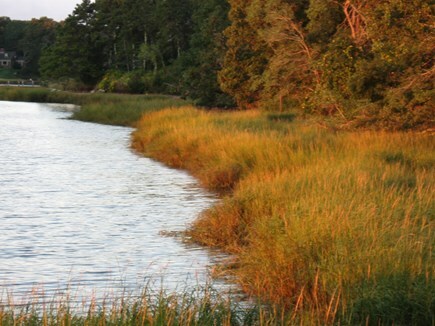 We are tucked into a corner off the dirt roads of exclusive Mayflower Point and on the intersect of where the Namequoit River meets Little Pleasant Bay. The 100 yard walk to our landing where you can launch your kayak or canoe out to the Bay is ideal for early morning explorations. We think the fact that the cottage is modern, light, comfortable with windows on all sides and early morning sun helps to make a person feel surrounded by nature. 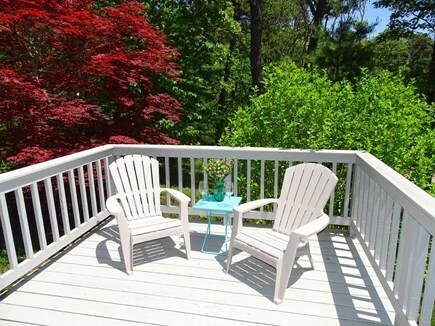 The trees attract the birds and the wrap around deck with outdoor seating making the whole experience one of complete relaxation with comfort at an affordable price. Orleans is the best of the Cape towns but then we are totally prejudiced. Orleans is centrally located on the outer Cape at Exit 12 -- the elbow of the Cape. Take a look on a map....we are surrounded by water and have Nauset Beach (ocean) and Skaket Beach (Cape Cod Bay). Those plus Town Cove and many town landings affording a variety of salt water experiences. We have Rock Harbor for beautiful sunsets and a bevy of local charter boats where you can fish for stripers and blues. Our downtown area and East Orleans have many wonderful restaurants to enjoy along with some unique shopping. We are only 30 miles to Provincetown and only 6 miles to The National Seashore entrance. Downtown Orleans has the Cape Rail Trail, an 18 bike path where you can easily go in either direction -- toward its beginning in Dennis or its end in Wellfleet. We have local theatre, music, wonderful galleries. Orleans has it all!